Lush is one of my favourite brands, one of the reasons being that they bring out amazing limited edition products around the holidays. And who doesn't love that? Of course, come Easter, they have released some amazing products for the holiday! I was lucky enough to have a four of the most gorgeous products sent to me to try out, and I couldn't be happier! 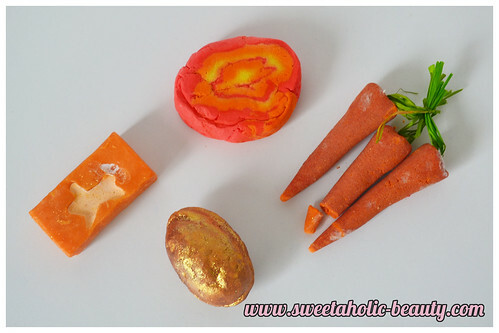 I was sent the Carrot Soap, the Golden Egg Bath Ballistic, the Brightside Bubble Bar and the Bunch of Carrots Bubble Bar. These products are absolutely adorable, and are so true to the theme of Easter! I absolutely love the bar soaps from Lush. Usually I dislike bar soaps, but most of the ones I've tried from Lush are absolutely amazing! This one really lathers up beautifully, and smells amazing! This is my favourite out of all the products! I broke this up to about five pieces so that I didn't use it all at once, and I was so impressed. Not only does it smell amazing (a bit like Fruit Tingles) but it bubbles up like crazy! Just a small piece of this made a crazy amount of bubbles! This is really cute, but the glitter is crazy! Just taking this out of the box and my fingers were covered in golden glitter! This one was really lovely and was really relaxing, although after using the other bubble bars, I was disappointed by the lack of bubbles! In saying that though, the bath left my skin feeling very smooth, so it was worth it! I was also impressed that the glitter did not stick to my skin in the bath! 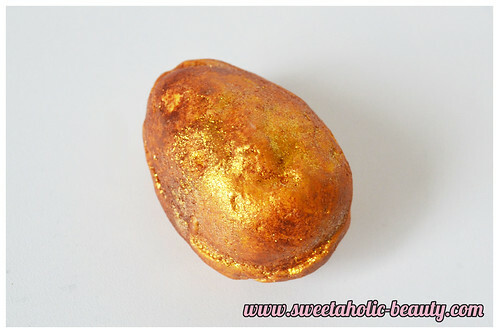 As you can see, the Golden Egg Bath Ballistic made the bath mostly yellow rather than golden, but when you got in close you could see the beautiful golden shimmers! The Bunch of Carrots Bubble Bar didn't do much aside from making it really bubbly, which was nice, so I'm not complaining! 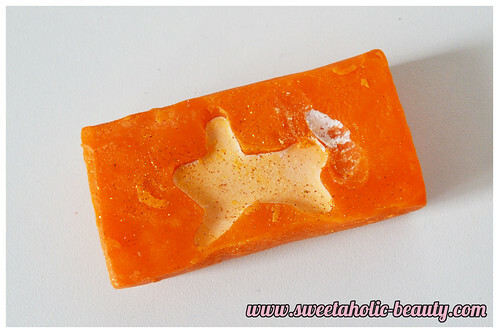 The Brightside Bubble Bar also made lots of bubbles, but it gave the bath an orange hue, hence the lighting in the photo! Have you tried anything from the Lush Easter collection this year? If so, what are your thoughts? 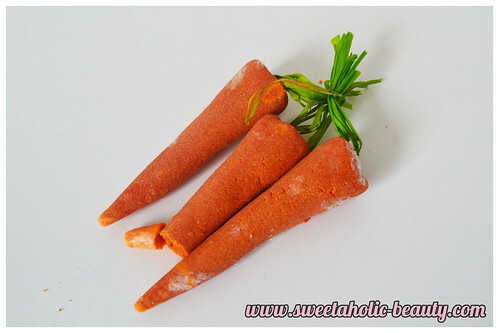 I'm so amused by these hahahahah I need carrot bath bombs in my life! Golden Egg and Brightside are my favourites from the Easter range. Despite the mess from Golden Egg, it's very pretty and smells just amazing! I love LUSH and I really love this EGG!!!! 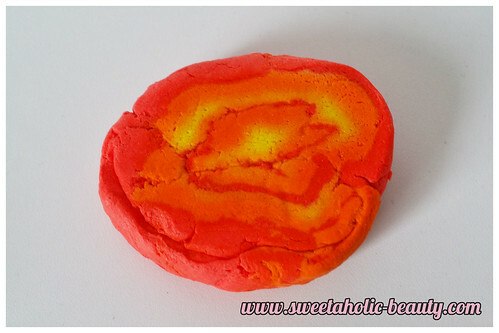 The brightside bubble bar looks so good!! Need to pick that up before they go out of stock for good! So cute! How insanely glittery. And the carrots are so cute. 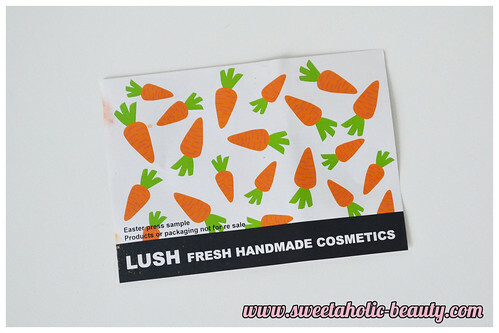 The carrots are too cute! Being a seasoned Lush Addict, I'm very critical of holiday limited editions. Everybody knows I hate Snow Fairy, Creamy Candy and Honey I Washed The Kids scent families, so I wasn't 100% impressed with the usual recycling of fragrances. HOWEVER, sometimes, certain fragrances smell better as different products, say, I hate HIWTK soap and shower gel, but I loved Shoot For The Stars ballistic at Christmas last year, and I hate SF shower gel, but loved the lip tint, and CC bubble bar and Rockstar soap, but love the perfume. They do smell different. I still have a whole spare Brightside from last year, and it's beautiful, but I'm just not having baths anymore. I'll tell you, STOCK UP ON BRIGHTSIDE, it's INCREDIBLE. The rest is hit or miss. Oh My God! That just might be the cutest things I've ever seen! 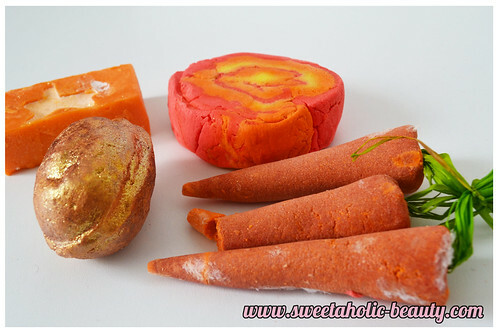 The carrot bath bombs especially. and the golden egg thingie as well.. I need to check lush out sooon!!!!!! P.S. Thanks for dropping by my blog and checking out my post!